Hi there! Today, we speak about the satellites of Uranus. They have been visited only once by a spacecraft, i.e. Voyager 2 in 1986, but we dispose of Earth-based facilities, which are able to give us some clues. The study I present today, Red material on the large moons of Uranus: Dust from irregular satellites? discusses the fact that the main moons appear to be redder than the large moons of Jupiter and Saturn. Let me define redder first: the surface of these bodies reflects the Solar incident light. A spectral decomposition of the reflected light tells us something on the material coating the surface. And the relative response of the surface in the different wavelengths is higher in the infrared for the large moons of Uranus, than it is for the moons of Jupiter and Saturn. This study, by Richard Cartwright et al., has recently been published in Icarus. First: Uranus. This is the seventh planet of our Solar System, which orbits in 84 years, and which seems to roll on its orbit. Actually, its rotation axis is tilted by nearly 90° (actually 97.8°), and its main satellites and rings orbit close to its equatorial plane. Their orbits are tilted as well. and the 9 irregular satellites, which orbit much further from Uranus, and which orbits may be tilted. Contrary to the other two groups, they have probably not been formed in the proto-Uranus nebula, but were former asteroids, which have been trapped by Uranus. You can find below some properties and orbital characteristics of the main satellites. All of these bodies have been discovered from the Earth. These are the targets of the study I present. You can see that they have limited eccentricities and inclinations, except for the inclination of Miranda, which probably results from a past resonant forcing by Umbriel. In the past, the orbital period of Umbriel was exactly thrice the one of Miranda, and this has forced its inclination, which was thus initially very small. Anyway, it remains close to the equatorial plane for Uranus. You can see below that things are different for the small satellites. These are very small bodies, which orbit very far from Uranus, on eccentric orbits. Besides, their orbital planes have just nothing to do with the equatorial plane of Uranus. This is why we believe they are former asteroids. Beside Margaret, they all orbit on retrograde orbits, while all the regular moons are prograde. Discovering them required to use telescopes of a least 5 m, the satellites discovered in 2003 having been discovered during a systematic survey with the Subaru telescope at Mauna Kea, Hawaii, over a field of 3.5 degrees. They all have apparent magnitudes larger than 20. Only one space mission visited them: Voyager 2, in January 1986. The spacecraft Voyager 2 was launched from Cape Canaveral, Florida, in August 1977. It benefited from a favorable geometrical configuration of the 4 giant planets to visit all of them. Unfortunately, this required the spacecraft to travel too fast to permit an orbital insertion. So, contrary to Cassini which toured around Saturn during 13 years, Voyager 2 just passed by. Its closest approach to Uranus was on January 24, 1986, at a distance of 81,500 km from the planet’s cloud tops. It permitted the discovery of 11 inner satellites, and partly imaged the large ones. 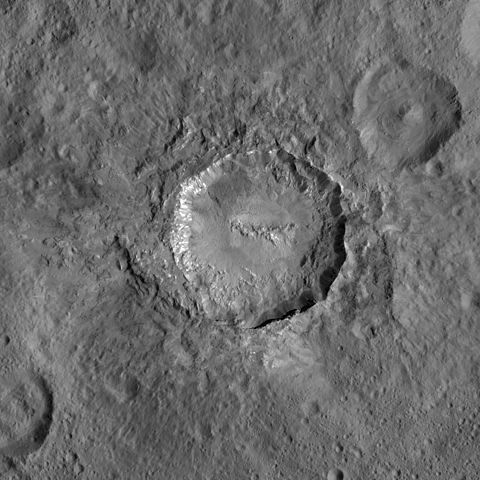 It revealed in particular geological features on Miranda, and analyzed the light reflected by the surface of these bodies. The study we discuss today supplements these measurements. 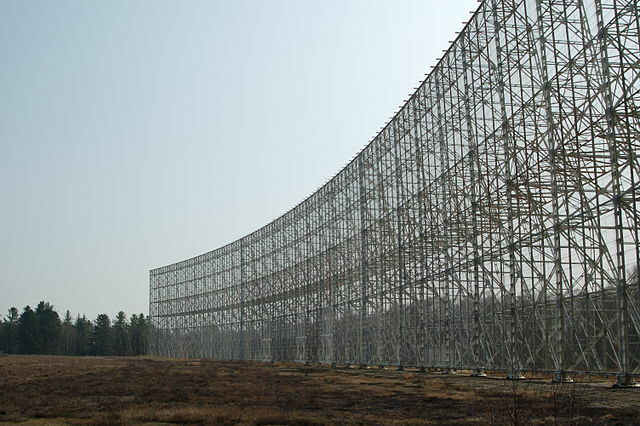 The authors used NASA’s InfraRed Telescope Facility (IRTF). This is a 3-meter telescope, optimized for infrared astronomy. It is located at the Mauna Kea Observatory (altitude: 4,200 m) in Hawaii (USA), and 50% of the observation time is devoted to planetary observation. Several instruments are available, the authors used the spectrograph-imager SpeX, which decomposes the incident light between 0.8 and 5.4 µm. In that study, the authors limited to 4.2 µm. The outcome of such observations is a plot amplitude vs. wavelength of a given surface element of a satellite. It is interesting to keep in mind that the regular moons rotate synchronously, permanently showing the same face to Uranus. The consequence is that they have a leading and a trailing hemisphere. During their orbital motion, the same hemisphere always leads. And this has implications for the surface composition, because the leading hemisphere can be polluted by the dusty environment. In other words: when you observe something on the leading hemisphere, which is not present on the trailing one, this is probably pollution. When you observe, you actually observe the surface element which faces you. And this depends on the dynamics of the planet. As you know, Uranus rolls on its orbit, while the satellites have an equatorial orbit. As a consequence, during a 84-y orbit of Uranus around the Sun, the Earth crosses twice the orbital plane, and two periods are favorable for the observation of the poles of Uranus and the satellites. The northern hemispheres of these bodies face us during half the orbit (42 years), while the southern ones face us during the other half. The last transition happened in 2007. Since then, the northern hemispheres of the satellites face us. And part of the visible face belongs to the leading hemisphere. The results show that for Ariel and Umbriel, and even more for Titania and Oberon, the leading hemisphere is significantly redder than the trailing one, while it is not the case for the major satellites of Jupiter and Saturn. 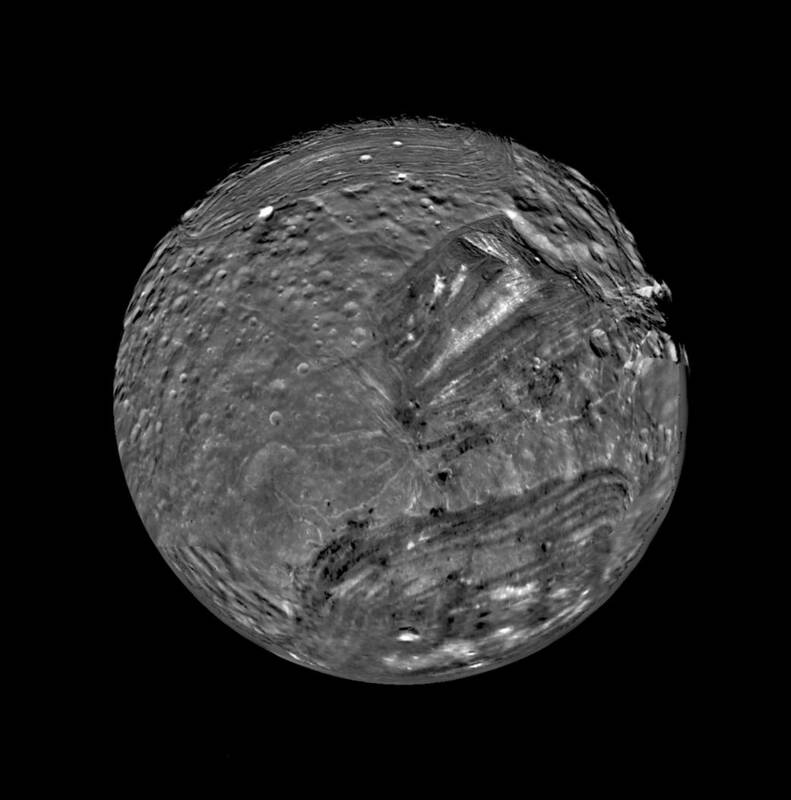 Titania and Oberon are the outermost of the satellites of Uranus, and the largest ones as well. To understand the chemical nature of this reddening, previous studies have conducted lab experiments, consisting in reproducing the spectrum of mixtures of chemical elements, which could be found on the natural satellites of the outer planets. Of course, the conditions of temperature and pressure are considered. Then the spectrums are compared to the actually observed ones. And it appears that the reddening agents should be tholins and pyroxene. Titania seems to have a red spot on its surface, which makes it the redder of the main Uranian satellites. Contrariwise, Miranda does not present this reddening. Latitudinal variations of color are not obvious, while they are in longitude, since they depend on the leading / trailing effect. Now, the question is: how did these agents reach the satellites? They are probably not endogenous, since similar satellites around Jupiter and Saturn do not have them. The smoking gun is the irregular moons: they are pretty red. And numerical simulations of the motion of dust expelled from these satellites by impacts show how they are likely to coat the leading sides of Oberon, Titania, Ariel and Umbriel. And this is what we observe! Of course, a space mission to Uranus would be very helpful… but this is another story. and the one of David Trilling. Hi there! Today we speak about Triton. Triton is something unique in the Solar System. It is a large satellite of Neptune, which has almost no mid-sized satellite, contrary to Saturn and Uranus. Several studies show us that Triton could have been a cuckoo, i.e. initially a Trans-Neptunian Objects, which has been trapped by the gravitational field of Neptune, and which is massive enough to have ejected the mid-sized satellites. Triton has been visited only once, by NASA’s Voyager 2 in 1989. This was only a fly-by, so we have images of only 40% of the surface. But the development of Earth-based instruments now permits to get data from the Earth, even if the apparent magnitude of Triton is 13.47 (Neptune is very far away…). This is the opportunity to present Triton’s surface ices: Distribution, temperature and mixing state from VLT/SINFONI observations, by F. Merlin, E. Lellouch, E. Quirico and B. Schmitt, all based in France, even if they used European facilities based in Chile. This study has recently been accepted for publication in Icarus. The table below gives you some numbers. You can see first that Triton has been discovered in October 1846, by the British astronomer William Lassell. The discovery happened 10 days after the discovery of Neptune, and this is of course not by chance. When the discovery of a planet is made and announced, it is much easier, or much less difficult, to re-observe it, since you know where to point your telescope. So, Neptune has been reobserved, and Lassell saw this point following Neptune. You can distinguish a satellite from a background star by the fact that the satellite follows the planet in its apparent motion. This was Triton. And Triton was the only known satellite of Neptune during more than one century, until the discovery of Nereid by Gerard Kuiper in 1949. As I said, Triton is pretty large, and its orbit is almost circular, as for many natural satellites of the giant planets. The tidal interaction with the parent planet tends to circularize the orbit, unless the eccentricity is excited by the action of another satellite… which cannot be the case around Neptune, since no satellite is heavy enough to move Triton. The interesting point about the dynamics of Triton is its orbital inclination. While natural satellites usually orbit close to the equatorial plane of their planet, Triton has a very large inclination, and its orbit is retrograde with respect to the rotation of Neptune. Usually, the natural satellites are formed with the planet, in the proto-planetary nebula, which is pretty flat… this is why their inclinations should be small. The inclination of Triton suggests it was not formed in situ, but has been trapped instead. Several studies have simulated this phenomenon, see e.g. your favorite blog. NASA’s Voyager 2 has been launched in August 1977 from Cape Canaveral, and it benefited from a favorable geometrical configuration of the planets. This virtual alignment permitted to fly by Jupiter in 1979, Saturn in 1981, Uranus in 1986, and Neptune in 1989. Voyager 2 is still operating, as an interstellar mission. Only a fly by may be frustrating, but for a spacecraft to be inserted an orbit around a planet, it must reach it slowly enough… which means take enough time to reach it. Neptune is so far away that we could not wait. So, its closest approach to Neptune was on August 25, 1989, and the closest to Triton 3 days later, imaging 40% of its surface (see video below, made by Paul Schenk, Lunar and Planetary Institute, Houston, TX, USA). It revealed an active surface, i.e. 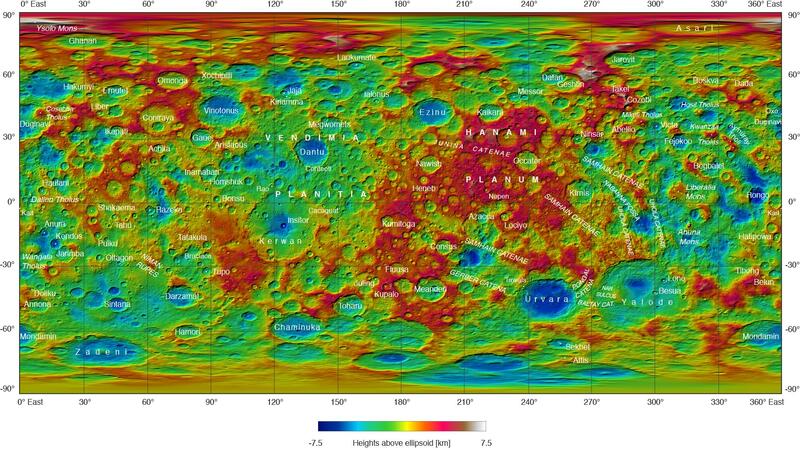 few craters, which means that the surface is renewing, and geological features, craters, ridges, plains, maculae… and even volcanic plumes. It also confirmed the presence of an atmosphere. Triton has a very tenuous atmosphere, which pressure is 70,000 times lower than the one of the Earth, i.e. some 14 μbar. 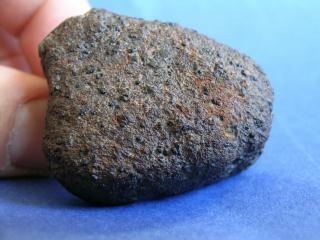 It is dominated by nitrogen, and extends 800 kilometers above its surface. Methane and carbon monoxide are also present. Its temperature is around 40 K, and Voyager 2 measured winds from the west from the surface to an altitude of 8 km, where the winds invert their directions, i.e. from east to west. This atmosphere is probably the result of outgassing of surface material and volcanic activity (geysers). It can be seen as an equilibrium between a solid phase at the surface, and a gaseous one in the atmosphere, of some of its constituents. The study I present today analyses the chemical elements present at the surface, which interact with the atmosphere. The used facility is the instrument SINFONI, on the Very Large Telescope (Paranal Observatory, Chile). The Very Large Telescope, VLT for short, is a facility operated by the European Southern Observatory in the Atacama desert, Chile. It benefits from a very favorable sky, at an altitude of 2,635 meters, and consists of 4 refractors, Antu, Kueyen, Melipal, and Yepun, each with a primary mirror of 8.2 meters. SINFONI, for Spectrograph for Integral Field Observations in the Near Infrared, operates on Yepun, and observes in the near-infrared, i.e. at wavelengths between 1 and 2.45 μm. 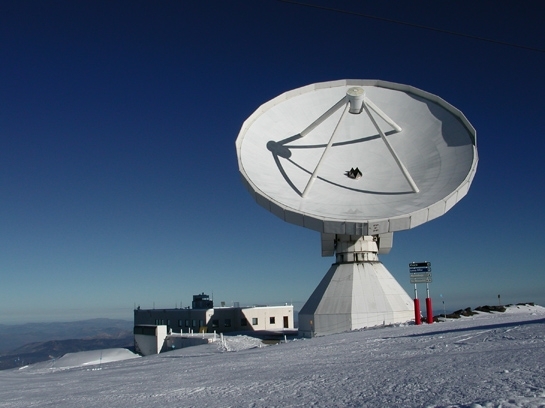 You can find below its first light in July 2004, observing the star HD 130163. As a spectrometer, it decomposes the light it observes following its wavelengths. You can find above a spectrum, on which you can see several minimums. These minimums are absorption lines, which reveal the presence of a chemical element. And this is the idea: the authors decomposed the Solar light reflected by the surface of Triton, to detect the chemical elements constituting it. The authors made 5 observations between 2010 and 2013, each of them lasting between 40 and 55 minutes. They supplemented their data set with two observations dating back to 1995, and one to 2008. 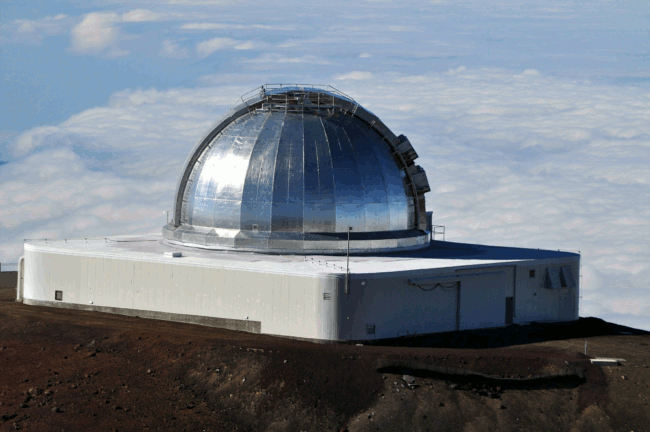 The 1995 observations were made at Mauna Kea Observatory, Hawaii. Two spectral bands were investigated: the H band (1.5 to 1.8 μm) and the K band (2 to 2.45 μm). Once the data are acquired, they must be corrected from the influence of the Earth atmosphere and the one of Triton, which have themselves constituents which absorb the light. Pretty easy for correcting the telluric lines, however the authors admit that the correction from Triton’s atmosphere is not entirely satisfactory, given the accuracy of data we dispose on. In particular, this correction might add an artificial signature of methane. After these corrections, and some that I do not detail, you have the spectra… What do to with that? The spectrum should look like something we know. We know the absorption lines of methane, carbon monoxide, carbon dioxide, nitrogen… but not necessarily under Triton’s conditions. The temperature at the surface should be around 40 K, i.e. -235°C / -390°F, to permit the coexistence of the solid and gaseous phases of these elements, without liquid phase, with a pressure of 14μbar. And when you look at the spectrum, you do not only have the location of the absorption lines, but also their amplitudes, which depend on many parameters, like the temperature, the grain size, the relative fraction of these components, and corrections accounting for instrumental constraints. 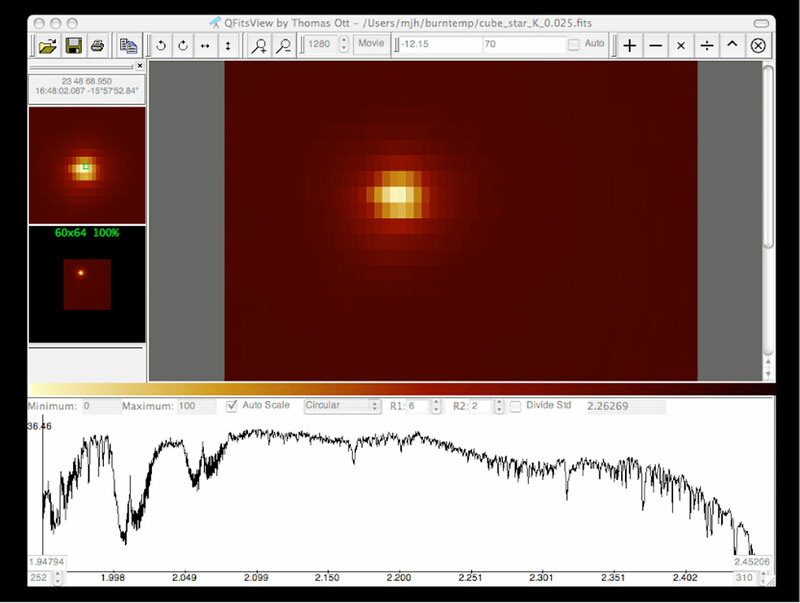 To get these parameters, the authors made several lab experiments in Grenoble (France), got plenty of spectra, and fitted their observations of Triton on them. Actually, lab experiments have been made in the past and used to previous studies, but in the present case this wasn’t enough, given the resolution of the new data. The results are essentially a confirmation of previous studies, but with a better resolution, and new data, which gives access to time variations of the composition. Actually, the variations of the distance to the Sun results in variations of temperature, which perturb the equilibrium between the solid and the gaseous phases. The methane (CH4) is mostly in diluted form. At least two populations of carbon dioxide (CO2) are present, with grain sizes of 5 μm and 25 μm, respectively. The carbon monoxide (CO) is mostly present in diluted form into nitrogen ice. The nitrogen (N2) ice temperature is 37.5&pm;1 K.
The study confirms already known longitudinal variations of the nitrogen and carbon monoxide surface abundances, and suggests latitudinal and/or temporal variations. This may be anecdotal, but the authors have detected two unexpected absorption lines, at 2.102 μm and 2.239 μm. The first one being present in one spectrum only, while the last one is detected on the three spectra. What do they mean? We do not know yet. and the ResearchGate profile of Bernard Schmitt.